As we all know, national education systems all around the planet are currently experiencing severe turbulence. For those who don’t have first-hand knowledge of what is going on, it seems to be all about governments having difficulties owning up to their financial commitments in these troubling economic times. We think the picture is more oblique. As figure 1 suggests, the current crisis is not just related to a growing lack of financial resources. It goes much deeper than that. Disruptive technologies. We have education and training technologies coming on-line that could really hurt the current business model. We expect these technologies to trigger a considerable downward shift in demand to a point where it could tear apart the sector’s already fragile financials. All of this, while attracting extremely resilient and well-endowed high-tech competitors. 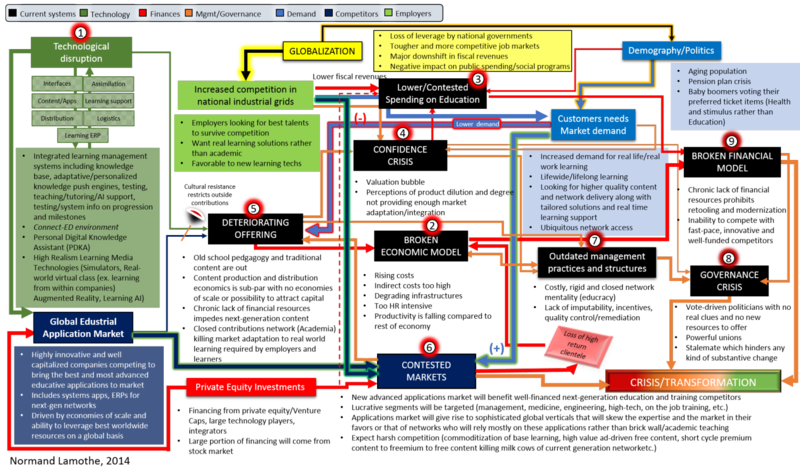 A broken economic model. The sector is currently unable to cope with ballooning costs (capital expenditures and HR) and falling subsidies. It has no scale economies to tap. All of this makes it impossible to maintain productivity and to finance the retooling necessary to keep pace with the rest of the economy and with future competitors. Lower/Contested public spending on education. Globalization and the consolidation of national industrial grids are forcing cash-strapped governments to a downward shift in fiscal revenues. Meanwhile, they find themselves obligated to shore up the economy and pay for rising health costs – two of the largest ticket items playing wanted by the eldest and the baby-boomers currently owning the political balance of power. As a result, education is becoming less of a priority. Confidence crisis. We now have a valuation bubble which keeps growing as more employers and learners are finding the current systems not being realistic enough in their product offerings so as to allow them to compete more solidly in a tougher and more competitive environment while recuperating their investment. Deteriorating product offerings. Faltering content creation and distribution economics and a chronic lack of financial resources are degrading current systems’ product offerings. A trend that will help give rise to a global edustrial application market which promises way more advanced, attractive, high-quality and personalized next-generation content. All of this, at the fraction of the current costs thanks to global scale economies and access to the world’s best educators, creators and application specialists. Contested markets. Current systems are already bogged down by archaic and rigid delivery networks which modernization, resource upgrades and retooling are impossible due to abysmal financials and rigid organizational structures. At the same time, we are seeing the first generation of advanced, open, flexible and innovation-driven education and training networks being brought on-line by well-endowed competitors determined to make this colossal strategic market their next big Prize. Outdated management practices and organizational structures. We are seeing politically, culturally, financially and organisationally-constrained managers caught in a power struggle with Unions and government officials. All of this, leading to an uttering stalemate at a time when major changes are needed. A broken governance model We have a politically-driven governance model in which decision-makers are not able to lead and provide the resources and the necessary accommodations to adapt to make the transition to a more innovative and competitive landscape brought on by edustrials and next-generation networks. A situation which we believe will find resolution in all levels of governments exiting the business of delivering education. All of this, while maintaining a regulating role and providing policy and financial aid to support fair access. 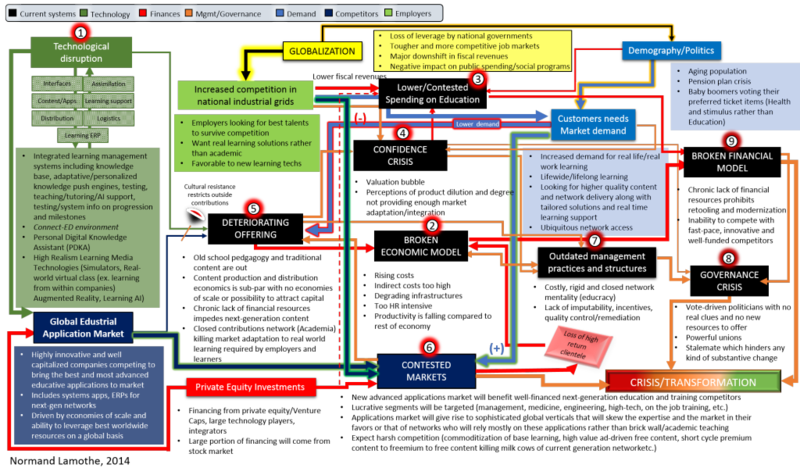 A broken financial model As it stands public national education systems are crippled by their inabilities to rake in additional revenues while at the same time they are being forced to deal with rising costs and lower subsidies. Competition is about to make their financial situation even more catastrophic, thus limiting their ability to modernize and keep pace with them. Faced with a cultural and contractual barriers, current systems will have great difficulties make optimal usages of external contributions (content, outsourcing, etc.). They will also be at great disadvantage with well-endowed edustrials and next-gen networks which global business models will allow them to leverage substantial cash and equity inflows from large venture capitalists, private equity funds, the stock market and their own resources stemming from their already dominant position in other strategic and lucrative global markets (technology, games, media, content, applications, etc..). Although some of you may not fully agree with what I just said, I think we should all agree on one thing. Our education systems aren’t by no means facing small transitional issues that may simply find resolution by virtues of a worldwide economic recovery. Although that would certainly help, we should not kid ourselves. What we have here is clearly a radical transformation in the making. One that may prove quite hurtful for some but for the best overall, especially for those who understand quick enough what needs to be done to surf this transformational trend rather that be caught by its swell. To further your views of what is coming, I have drawn up a sequence of events leading to this foreseen transformation. A sequence I will be writing and discussing about, here and elsewhere, for those interested. Please, do not hesitate to share your views on the matter, publicly or privately, and to connect. Thanks for your interest. See my contact info, if needed.